2nd Annual Surfin through the vines party is Saturday July 23, 2016 from 5:30pm to 10:00pm. Tasting room will be open, but the festivities start at 5:30pm. We found another great Surf band called Surfs up to bring us back to the ole' days of summer. Sorrel Bistro will be catering- and this will be a plated meal. Send your ideas for food options. We have not selected the menu yet. Tickets will be on sale next week. You may rsvp. for this save the date by sending your Name and # of tickets to christinagbv@gmail.com. Look forward to this great night with friends. Meet up with your favorite wine cliquers at Gershon Bachus every Thursday evening from 3:00pm to 7:00pm. Just a mingle and a chance to start the weekend at your favorite winery. Bring some friends to share the space. We've reserved your chair for you. CALL AND RESERVE FOR OUR BIG BAND BASH TUESDAY DECEMBER 21, 2015 6-10PM. GOURMET FOOD, BIG BAND MUSIC, GREAT WINE! $199 PER COUPLE. TICKETS ONLINE NOW. FOR DETAILS CONTACT CHRISTINAGBV@GMAIL.COM. Check out our new video featuring aerial video, interview with Kenny & Christina, and some of our favorite shots from weddings and our Fall crush. Every year, the Temecula wineries compete for the coveted Inland Empire Hot List's Best Winery title. We came in third last year, and we're looking to move up the ladder this time around. Currently, we're in second, but your vote could be the difference to getting us to the lead. Registration and voting takes less than one minute. Simply click here, sign up, vote, and a tip for others to see. Voting closes 11/2. This week has been one for the books here at GBV. 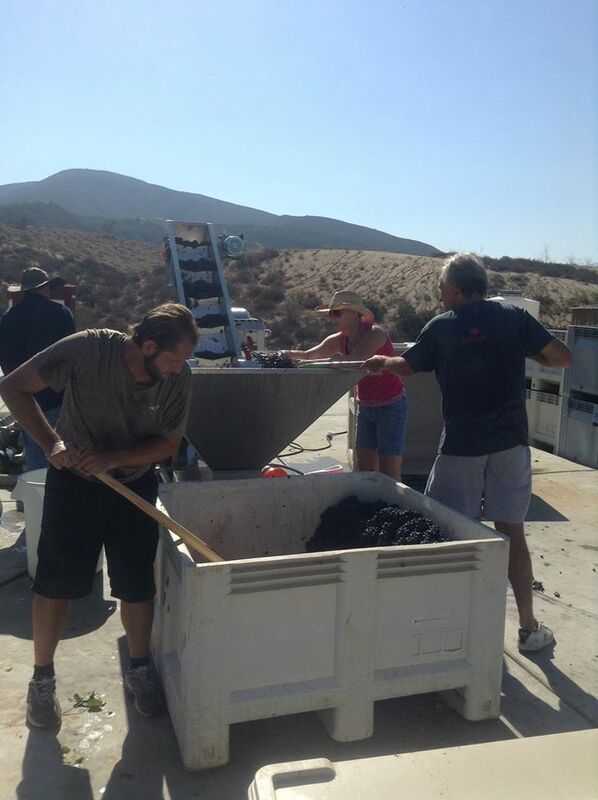 Along with a new website, we harvested and crushed our Zinfandel for the first time on-premesis. The grapes are fermenting in our concrete tanks and this year’s fruit is beautiful. Our production pad was extremely useful and our team did a great adjusting to the new work area. Armed with a six-pack of PBR tallboys, lead winemaker, Dakota, led the team to a perfect crush. The grapes this year were so perfect and packed so tight, we managed crushed only half the 2014 Zephyrus, which yielded about 3.5 tons. More to come. Fides is still on the vines for a later harvest. Hesperus (Grenache) and Erato (Cab Franc) to follow shortly. Although our love for wine has given way to an equal admiration for all things aged, we had to admit that our website had passed its expiration. So we spent the last handful of months scouring the archives at Hulse Photography for our favorite photos from the past few years. The result yielded a beautiful website filled with galleries and pages full of unforgettable moments at our weddings and in our tasting room. Every photo you see on this site was captured by the Justin and Julie Hulse. We can't thank them enough! The first GBV website: active since the dawn of the internet. Also, a special thanks to Marc Anderson, our all star art director and developer, who brought all the creative thinking, and to his girlfriend, Julia, who likely endured a few weeknights without a TV partner. Keep up with this page for more about what's happening on our end. Our hours will be kept up-to-date on our Tasting Room page, and, as always, on facebook.